Children’s nonfiction books are a superb way to learn unexpected, fascinating facts. While adult nonfiction authors who are enraptured with their topic are prone to ramble on and on, usually children’s nonfiction writers present the information succinctly, with vigor, clarity, and humor. 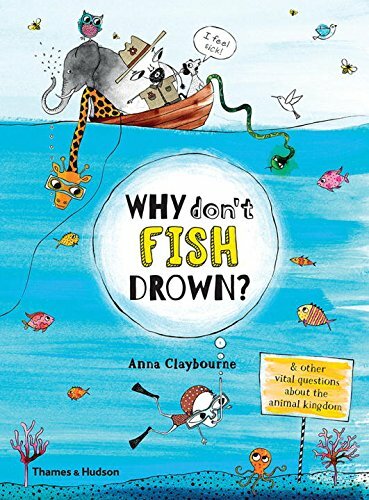 Such is the case with Anna Claybourne’s natural history book, called Why Don’t Fish Drown? Although focused on readers aged seven and up (grades two through seven), adults also will be riveted. Organized by 22 provocative questions a child might ask about the natural world, each provides an opportunity to expound on various themes: Who picks the names for animals? (classifying animals); Could my cat go vegan? (food webs and energy cycles); Can I make friends with a snake? (venom and poison); What color is a chameleon? (camouflage); Do animals need maps? (migration); Why do animals poo? ; and so on. Claybourne begins with the definition of an animal, followed by an excellent summary of binominal nomenclature (the whys and wherefores of assigning scientific Latin names). She explains that often a newly discovered animal is named after the person who first found it. Sometimes it’s named after someone famous. Readers young and not-so-young will be intrigued to learn that an Australian species of horsefly discovered in 1981, and finally scientifically described in 2011, is named after the American singer-songwriter-actress, Beyoncé. It’s called Scaptia beyonceae. Scientists were inspired to honor this pop music icon because the fly has a dense patch of golden hairs on the tip of its abdomen. Readers learn about evolution as Claybourne explains that all living species gradually change over time, adapting to new environments and hazards. She points out that today there are rats that are evolving to become immune to rat poison. We all know that most animals don’t need to clean their teeth, and Claybourne tells us why: “To start with, most animals don’t eat the same tooth-damaging diet that we do. The bacteria that cause tooth decay love sugary food. But if you’re a rabbit or a tiger, you just eat plants or raw meat, not decay-causing doughnuts or soda. A fascinating exception is hippos. “They open their mouths wide underwater to let fish pick dirt and bugs from around their teeth. The fish get a meal and the hippo gets a cleaning!” An underwater photograph of a hippopotamus with cleaner fish nibbling at its teeth accompanies the text. In the pages on sleep (Do owls ever go to bed? ), we learn that swifts can spend months at a time in flight, never landing. Scientists believe that to get needed sleep, they fly high in the sky, and then drift downward while they take a quick nap, waking up before they get too close to the ground. Every page is enlivened by original illustrations by Claire Goble, as well as photographs (a surprisingly lovely one of caterpillars eating a leaf on page 27 and an extraordinary photo of a flying bat chasing a moth on page 47) and fine works of art. Nothing is taken too seriously. Goble added a devil’s horn and tail to a 1685 etching of a skeleton by Pieter van Gunst. The message, delivered in this tongue-in-cheek manner illustrates that humans once had tails, but gradually lost them as the tails became unimportant for survival. To illustrate the question, “Could my cat go vegan?” Goble has drawn a man with a huge knife and fork on the left page. He’s chasing an unhappy gingerbread man on the facing page, who is run, run, running away as fast as he can. All these scientific vocabulary words are collected in a glossary at the back of the book. There readers can refresh their memory for the meaning of words such as bioluminescence, carnivore, plankton, regurgitate, venom, and vertebrate. Bound in heavy cardboard like a board book, but with regular paper for the text, this is book is a superb introduction to the animal kingdom for the budding biologist or scientist as well as anyone who enjoys learning about the amazing and wondrous world we live in.